Face it, those hook-less hangers in some hotel closets are a pain to use. They are meant to stay in the closet on the specifically made rod. Some of them never come off. That might be okay if you don’t ever intend to remove the hanger from the closet. But, what if you need to hang your dress near the shower to steam out the wrinkles? Or, what if you want to hang up your travel shirt after you’ve given in a quick wash? It just doesn’t work. That’s where the ConvertAHanger comes in. When I first saw this, I thought it might work. I was right…and then some. It’s great. Not only is it easy to pack and takes up very little room, it seems to be very durable as well. It’s also made in the US…which is always a plus in my book. I’ve used it and I love it. It’s going to be a permanent part of my luggage. Check out more about it at http://www.convertahanger.com/. We’ve all been there…..hotels that don’t use standard hangers but instead offer two theft proof type that only fit on their racks. They either have no hook or tiny ones. 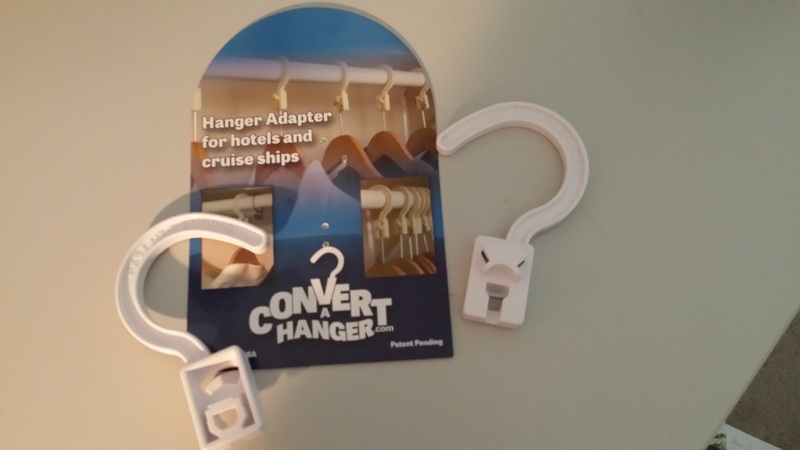 Fortunately, one company has made a product that allows the traveler to convert those hangers to normal ones. And they work great. I may now stop packing either inflatable or folding hangers and instead pack a couple of ConverAHangers since they are much smaller and lighter. The convert a hanger allows hotel travelers to convert the hotel anti-theft hangers, the ones that don’t have hooks, into ones that have a hook and can be used throughout their hotel room. Especially to steam their clothes in the bathroom, dry their hand washables and dry other wet items like a jacket.